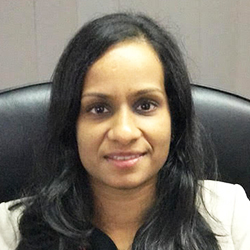 Dr Gayathri Kumarasinghe graduated from the University of New South Wales in 2003 and completed her cardiology training at St Vincent’s Hospital, NSW. She completed a PhD in the field of cardiac transplantation at Victor Chang Cardiac Research Institute and the University of New South Wales. She has been awarded Young Investigator Awards and the President’s Prize for presentation of her research at scientific meetings of the Transplantation Society of Australia and New Zealand. She has published in international peer-reviewed journals, and has presented at several national and international scientific meetings. Gayathri undertook a Fellowship in Pulmonary Hypertension and Adult Congenital Heart Diseases at Oxford University Hospitals, UK. During this time she also gained experience in cardiac MRI and maternal cardiology. She is a Conjoint Associate Lecturer at University Of New South Wales, St. Vincent’s Clinical School, and is involved in training and mentoring medical students, physician and cardiology trainees. Special interests in cardiology: advanced heart failure, pulmonary hypertension, adult congenital heart disease, cardiac MRI and maternal cardiology.